Kamala Masters began practicing meditation in the mid-seventies attending retreats in the Theravada tradition. In 1977 she met Anagarika Munindra, her first teacher, who taught her the value of being mindful in everyday life. In 1985, she began to practice vipassana and metta meditations intensively with Sayadaw U Pandita with whom she temporarily ordained as a Buddhist nun in 2001 and 2003. In 2005, she began practicing cittanupassana, contemplation of mind, with Sayadaw U Tejaniya. She integrates this teaching with what she has learned from her other respected teachers. 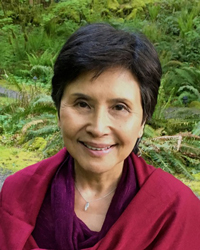 Since the early nineties, Kamala has been teaching in the United States and abroad, and is a Guiding Teacher and member of the Board of Directors at the Insight Meditation Society. In 1995 she co-founded Vipassana Metta Foundation with Steve Armstrong, developing the Maui Dhamma Sanctuary for self-reliant students to practice. She served as an editor on the Vipassana Metta Foundation Translation Committee for Mahasi Sayadaw's Manual of Insight, published by Wisdom Publications in 2016.